In the days that followed the recent publication of a piece about the Alhambra concert hall, I was struck by the number of stories shared by people in Bordeaux, who clearly cherished many happy memories of the venue. Many of the tales I read were recounted by Philippe Serra (pictured left), one of the contributors to a benchmark book about the local music scene, Denis Fouquet's "Bordeaux Rock(s)". For Invisible Bordeaux, Philippe kindly agreed to talk us through some of the events he attended at this iconic venue, in some cases drawing on his draft memoirs of the 1962-1972 period. Here then are a number of snapshots that will take us back through time, but in each case the backdrop remains the same: we give you the Alhambra. "I attended this concert more out of curiosity than because I was familiar with the artist. It turned out to be a pleasant surprise. He may have limped but he was full of energy, clad in leather yet demonstrating heightened sensitivity, he boasted a distinctive and yet almost inexplicable stage presence. At the time we hadn't begun to regularly use the word "charisma", but that is certainly what it was. In my post-war childhood years I had admired Line Renaud before becoming a jazz enthusiast, and I hadn't exactly been drawn to rock'n'roll. By the time I left the Alhambra that night, I had become a rock'n'roll convert, although my faith was still very fragile!" 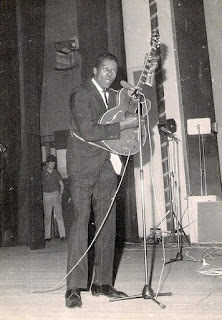 Chuck Berry, hooked up to his 30-watt Vox amp. "This was an unmissable event! Memphis Slim, Ronnie Bird, Antoine and Chuck Berry. I was astonished by the latter's energy combined with his notable economy of means: Berry's red Gibson guitar was plugged into a small 30-watt Vox amplifier that wasn't even fed through the house PA. Then again, the Alhambra PA was probably no more powerful than Chuck's Vox amp! 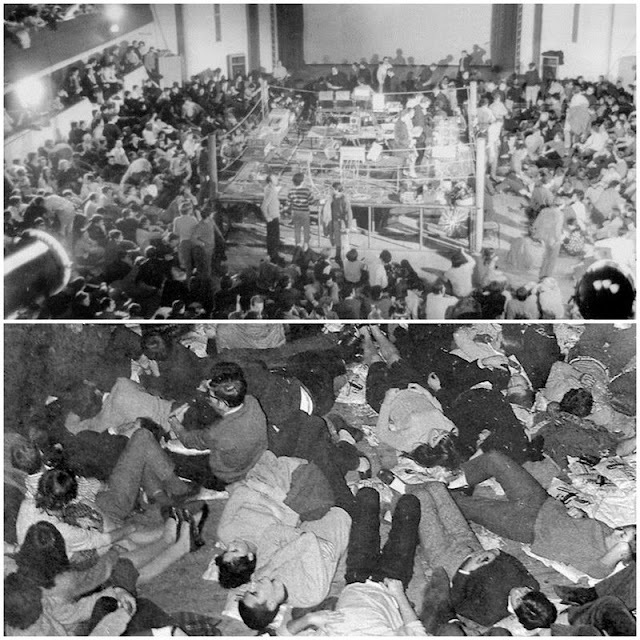 Rock concerts still retained a music hall format at the time, with a support bill comprising a host of artists. You would sometimes even see tightrope walkers! If my memory serves me well, the Chuck Berry show opened with a performance by a foot juggler…"
"Pierre Henry was like some kind of DJ beamed in from the next century, setting up his tape players, mixing desks, amplifiers and what seemed like generators, inside a boxing ring positioned in the middle of the Alhambra's Casino hall. His attitude was unpretentious and down-to-earth, even though he was piecing together an other-worldly concert. Sound was fed through ten separate channels into groups of speakers that formed a sort of magic circle surrounding listeners lying on mattresses. I was there ahead of the event and helped out as best I could with the final fine-tuning, which involved hanging huge sheets from the ceiling down to the floor at strategic points, so as to improve the acoustics of the cube-shaped venue. On the night of the performance, no doubt distracted by the large crowd of excitable youths, I barely noticed that the whole set-up had been shifted into the Alhambra's other hall! Despite its oblong shape, the permanent stage and the balcony which ran around the three other sides, it turns out that the theatre was a better match for the perfect sound which was sought than the ballroom where we had put all our efforts into setting things up. What still remains with me is the light show which was projected onto the ceiling, the first psychedelic show I'd attended. Scarlet amoebic shapes surrounded by shades of yellow, branching out in all directions against a dark green background. The Paul Henry concert was a strange and captivating personal experience, giving me the impression of being totally immersed within the living art of our time." "This was the bravura piece of the outrageous Living Theatre company. They made use of a huge amount of scaffolding which no doubt accounted for much of the ten tons of equipment that their leader Julian Beck spoke of in interviews about the show. This new interpretation of Mary Shelley's classic tale was ideally designed to provide its receptive audience with an unforgettable experience by unparalleled theatrical performers." "The Alhambra was almost an embryonic multiplex with its hall, its bar, its lobbies and its two main venues: on one side there was the casino which, other than its small stage featured nothing but a dancefloor; while to the other side was the concert and theatre hall. The large door which separated the two was almost always closed. On this occasion it was open, enabling the public to mill between the two venues to enjoy the "Guinch Experiment" that formed part of the Sigma 5 arts festival. Music-wise, two groups were on the bill: Soft Machine and the Ronnie Scott Band. The use of the twin stages meant the bands could perform simultaneously. The stalls had been removed from the theatre and in the middle of the venue there was a massive inflatable installation that had been conceived by the visual artist Jeffrey Shaw. But I didn't get to see much of the band there as I only had eyes for Soft Machine, who were performing next door. The floor of that venue was entirely covered with balloons and, incredibly, mid-way through the performance, an elephant suddenly appeared; its sole task appeared to be that of going about bursting the balloons! You can imagine the chaos that ensued! Of course, I might not have been quite so surprised at this turn of events had I seen the elephant (on loan from a travelling circus) promoting the unforgettable show in the streets of Bordeaux that afternoon. My most vivid memory of the concert is an intense 20-minute drum solo by a bare-chested Robert Wyatt, who had been given completely free musical rein by his bandmates. Left: the Ronnie Scott Band with large inflatable contraption (Sigma archives). Right: Robert Wyatt mid-solo (photo: Anne Lafosse). This was the first time I'd ever been so close to a musician of this calibre, I could almost reach out and touch him. Even though I remember that he was positioned higher than us on the raised platform, the memory that remains is of him being entirely surrounded by the audience, including myself, and we were all bewitched by his performance!" "This was a couple of years before the release of Golden Brown, but there was already a sense that the Stranglers' punk sound was making way for a more tuneful approach. I listened carefully to this fine band and enjoyed them thoroughly, but I kept a particularly close eye on Jean-Jacques Burnel's legwork. This wasn't because he was the group's resident Frenchman but rather because he was the bassist, and I'd taken up that very instrument. 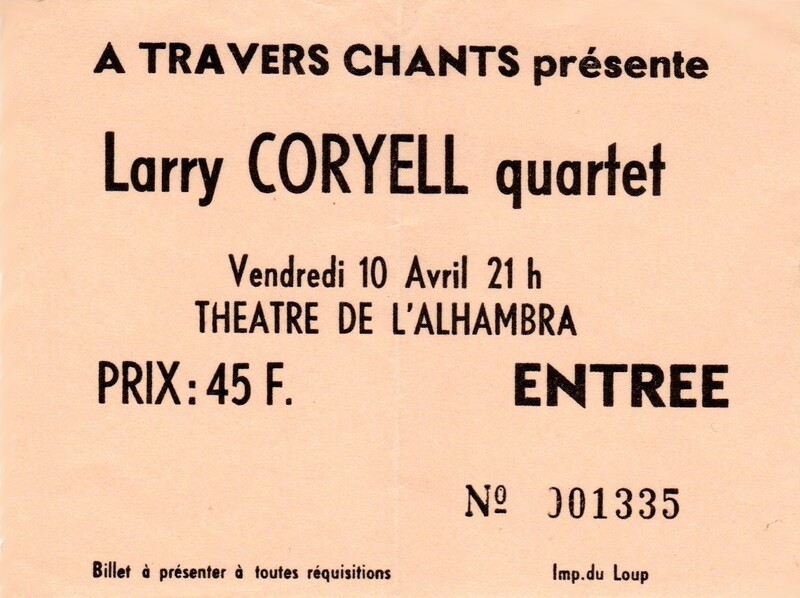 Bordeaux musicians, whatever their level of proficiency, made a point of coming to the Alhambra which for long had been the perfect place to admire the greats, and perhaps to borrow, more or less consciously, new things from them in this permanently-evolving world of rock culture!" "I appreciated the all-round versatility of the fine guitarist Larry Coryell, who was back in an acoustic period. 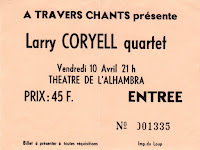 I had even enjoyed him as a singer on the album The Real Great Escape, but the concert ticket had this date enigmatically billed as the "Larry Coryell quartet". 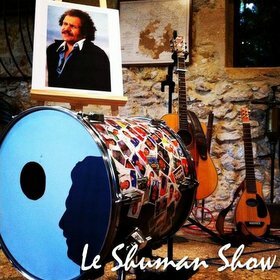 As it turned out, alongside Larry there was another six-string virtuoso, Philip Catherine and even, I seem to recollect, a third guitarist, namely the impressive Paco de Lucía. It was an absolute delight! The Alhambra, in keeping with the Granada reference of its name, always knew how to spring surprises on its audiences!" "As part of the Sigma 17 arts festival, the Alhambra put on a show that gave equal billing to a number of artists: the progressive new wave outfit Indoor Life, whose lineup featured a trombonist - I had already seen them in concert at the Grand Parc salle des fêtes (at the time, US avant-garde artists were very keen on Bordeaux); Rita Mitsouko, a likeable duo whom you never would have thought would later produce a video that achieved worldwide success; and Bernard Szajner, who had invented a laser harp which he demonstrated masterfully. Gérald Lafosse, the son of the founder of the Sigma festival, had recognised the immense potential of an innovative light show at the Pierre Henry concert, and had consequently began a career in stage lighting. 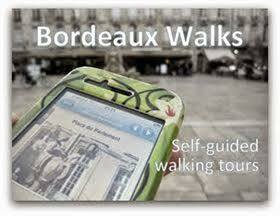 He worked for Szajner and moved to Paris. 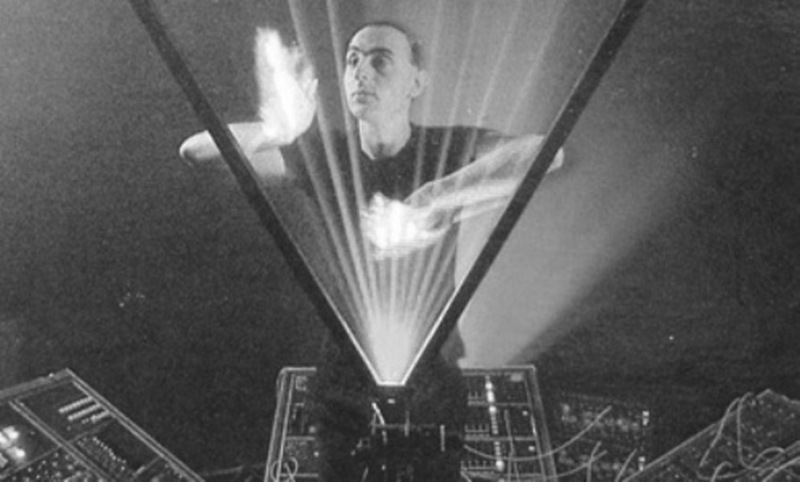 When Szajner's laser harp joined Jean-Michel Jarre's setup, Gérald followed suit. And that is how he went on to conceive the atmospheric lighting of the global synth star's colossal concerts in China and elsewhere. 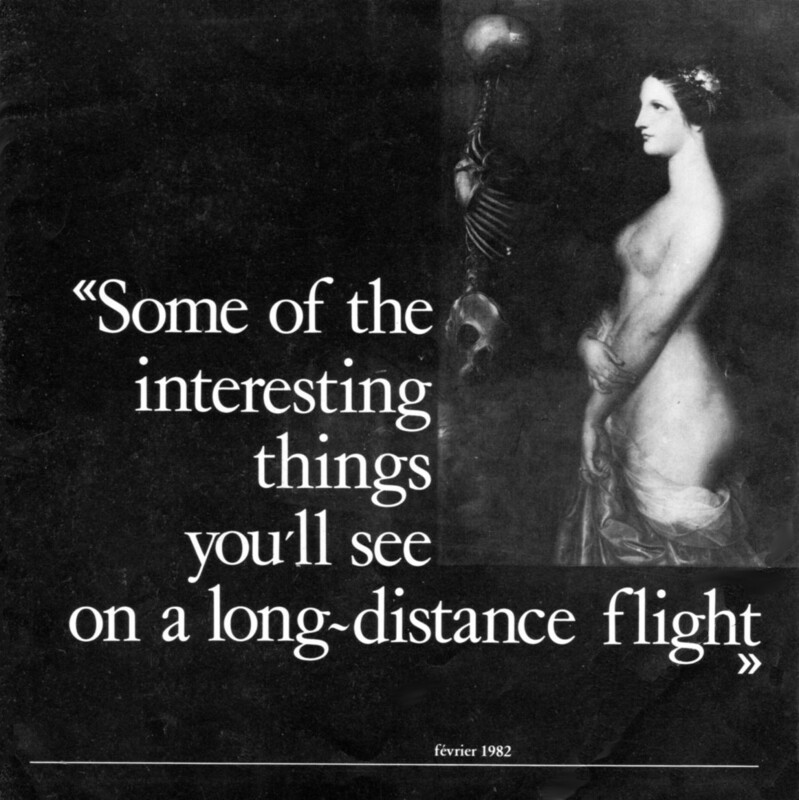 Which just goes to show that a straightforward show put on at the Alhambra could ultimately lead to far greater things..."
Cover of the tour programme. 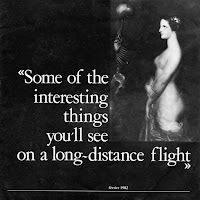 "This fashionable record label offered a great lineup of artists on a tour that went by the name of "Some of the interesting things you'll see on a long-distance flight". It included Tuxedo Moon vocalist Winston Tong (from San Francisco), Manchester's The Durutti Column, Richard Jobson (London), Paul Haig (Edinburgh) and the Parisian band Antena. Of the bunch, the one I remember best is Durutti Column, which was essentially the project of a solo performer on guitar. This reminded me of an expression I'd often heard in my youth: "Every Englishman is an island". And I believe that it was, for the punter that I was, my final gig at the Alhambra. " Massive thanks to Philippe Serra for this fabulous trip back in time!